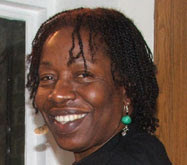 Magdalene Odundo was born in Nairobi, Kenya in 1950. As a child she lived in Kenya and India. From 1968 to 71 she attended the Nairobi Polytechnic in Kenya, while there she studied Graphic Art. In 1971 she left Kenya to attend Cambridge College of Art in Cambridge, England to continue her study in Graphic Design. Odundo grew restless with this medium and experimented with various mediums. In 1973 she moved to Farnham, England to attend West Surrey College of Art and Design. At West Surrey she settled on ceramics as her medium. In that first year at West Surrey she had the opportunity to visit the Cornwall Workshop of renowned potter Bernard Leach. Leach was the father of the modern British studio ceramics movement in the 1920's. Marla Berns describes this movement, "as a tradition based on principles of simplicity and purity of form derived from Asian ceramic models." Because Odundo grew up primarily in Nairobi she was not exposed to the traditional pottery of the rural areas of her country, it was not until she went to England that she became interested in this traditional African art forms. In 1974 Odundo spent 3 months at the Abuja Pottery Training Centre in Abuja, Nigeria. She studied various techniques of pottery-making including hand-building from Gwari women potters like Ladi Kwali. Odundo went back to England to finish her classes at West Surrey, but returned to Africa in 1975 to do research for her thesis which was a comparative study of women's pottery techniques and of the ceremonial use of vessels. For this study she traveled to native Kenya to study her own people,the Abanyala, a subgroup of the Abaluyia living in Kenya and Uganda. In 1976 she graduated with a Bachelor of Arts degree form West Surrey. After graduation she traveled to California and New Mexico where she learned about Pueblo pottery, specifically San Ildefonso blackware and Maria Martinez the most famous San Ildefonso potter. Odundo spent three years teaching at the Commonwealth Institute in London and then entered the Royal College of Art in London, England to continue her study in ceramics. She graduated with a Masters degree in 1982. In the 1980's Odundo exhibited often in Britain in such solo shows at ICA Galleries in London in 1983, the Victoria & Albert Museum in London in '86 and in group exhibitions such as two shows with Craftsmen Potter's Association of London. Odundo had her first solo exhibition in the United States in 1991 at the Anthony Ralph Gallery in New York. The show of 12 new vessels sold-out. Seven were purchased by museums with 2 going to the Smithsonian (Ceramics Monthly 30). The prices ranged from $5600 to $7200 at that show. Since that time she has exhibited in the U.S. in shows such as Africa Explores: 20th Century African Art, organized by the Museum of African Art in New York, Contained/Uncontained: 4 Clay Artists at the African American Museum in Dallas and the solo exhibition Ceramic Gestures: New Vessels by Magdalene Odundo organized by the University Art Museum, University of California at Santa Barbara. She also has had the opportunity to exhibit in solo and group shows in Germany, Austria, Belgium, Denmark, Holland, France, India, Malaysia, Canada and Kenya. Almost everything I have read about Magdelene Odundo has championed her work, but 1989's comments by Paul Rice, in British Studio Ceramics in the 20th Century, do give a bit of a cynical viewpoint. Magdelene Odundo has had no problem getting her work noticed. Long before Odundo graduated from RCA in 1982 she was being heralded by some as being the greatest potter to emerge since Elizabeth Fritsch. She has had the dubious distinction of being the most hyped ceramic artist in Britain. Prices for her work, which were very high when she was a student, have now reached a point where she is the most expensive potter of her generation in Britain. Naturally, this high-profile promotion in a craft world not used to such things has caused a great deal of discussion and not all of it favorable. If credit or blame is to be attached, then it probably more properly belongs to promoters than to Odundo. The controversy has tended to overshadow the fact that Odundo is an extremely fine potter. At her best, she has a tremendous command of form ... although Odundo has not yet lived up to her promotion, she certainly has the potential to do so. She has only been making pots (in very small quantities) for a comparatively short time. One hopes that her very early success will give her greater freedom to develop rather than putting her in a straight-jacket. Odundo's vessels are coil-built, not thrown, on the wheel. They start with a blend of 75% red clay from Stoke-on-Trent England and 25% sandy yellow clay from southern England. The body of the piece starts with a cone of clay pulled upward while hollowing out the middle using a gourd or coconut shell scraper. The process is continued by adding coils of clay and scraping and smoothing the neck and head into shape. The leather hard vessels are burnished, slip is applied and burnished again to a luster. Burnishing is the act of rubbing the leather hard pot with items such as pebbles until the vessel is smooth and shiny. Adding slip--a thin mixture of clay and water--and burnishing again gives the pot a seamless, smooth high-gloss finish without using glaze. Resonance and Inspiration: New Works by Magdalene Odundo examines the beautifully restrained ceramic forms of one of the most highly regarded international ceramic artists. Odundo brings together the art of sculpture and the craft of pottery to create striking ceramic vessels, which have resonances that range from early Cycladic sculpture to traditional African pottery. 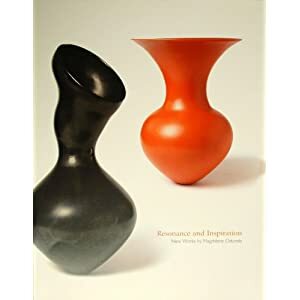 The catalogue was published in conjunction with an exhibition of the work of Odundo that was on display at the Harn Museum of Art September 5 to December 31, 2006. The preface for Resonance and Inspiration: New Works by Magdalene Odundo was written by Harn Museum of Art Director Rebecca Nagy, with contributing articles by Susan Cooksey, Linda Arbuckle and Augustus Casely-Hayford. Susan Cooksey became the curator of African art in the Harn Museum in 2006 after serving two years as the associate curator. She has held various positions at the Harn Museum since 2001 and worked as a curatorial assistant for the University of Iowa Museum of Art from 1997-1998. Cooksey holds an M.F.A. from the University of South Florida, a masters degree in art history from the University of Florida and a doctorate in art history from the University of Iowa.